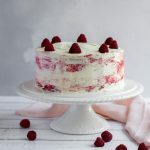 Modern and elegant, this White Chocolate Raspberry Ripple Cake features a velvety white chocolate buttercream, two layers of light vanilla sponge, sharp fresh raspberries and a swirl of homemade raspberry puree. I’ve been living in London for quite a while now. In August, it’ll be my two year anniversary emigrating from Canada, and it will also be the longest I have ever spent away from Victoria. To be honest, I thought the idea of being away from Canada so long would make me more emotional. I love everything about my home country. I love how friendly and welcoming the people are (it’s a stereotype for a reason! ), I love the laid-back attitude of the island where I was born, and I love how fresh and clear the air is, even in the city centres. The air is definitely an area where London falls just a tad short. From my entire childhood growing up as a West Coaster to running around the prairies with my extended family to making new friends and connections at a food conference in Montreal, Canada will forever be my home. I’m a Canuck through and through. But in many ways, I now think of London as my home too. I’ve started my adult life here. It’s given me my first career, it’s shown me how to be brave and more confident in my abilities, and it’s found me love. 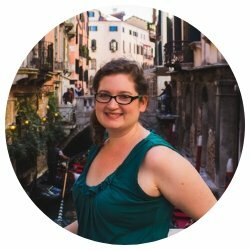 This vibrant, culturally diverse city holds a large piece my heart. 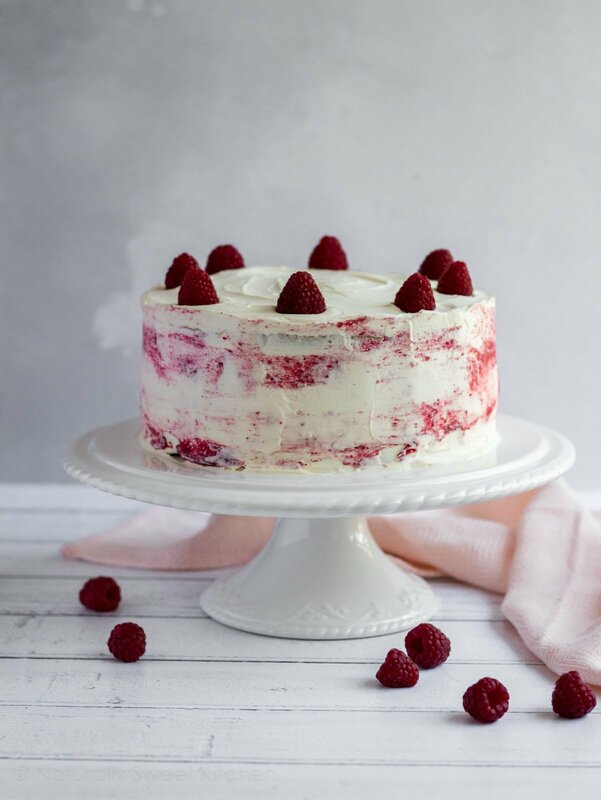 So although I made this White Chocolate Raspberry Ripple Cake in celebration of Canada Day in a week’s time, I like to think if it as a multicultural party. I don’t think I should feel obligated to say I love one country more than another simply because I was born in one. In many ways, the UK has given me a rebirth – one into full-on adulthood (which, tbh, is damn difficult most of the time) – and I feel that deserves cake too. Besides, two parties mean you get to have two slices of cake, right? Aesthetically, the layers of this White Chocolate Raspberry Ripple Cake didn’t work quite as I imagined. I wanted a marble effect of the raspberry batter running all through the white cake, but for some reason, they sort of rose up to the top. But it still tasted damn nice, so I decided to go with it! This is a Canada Day cake, so obviously, I wanted there to be as much white and red as I could get into it. 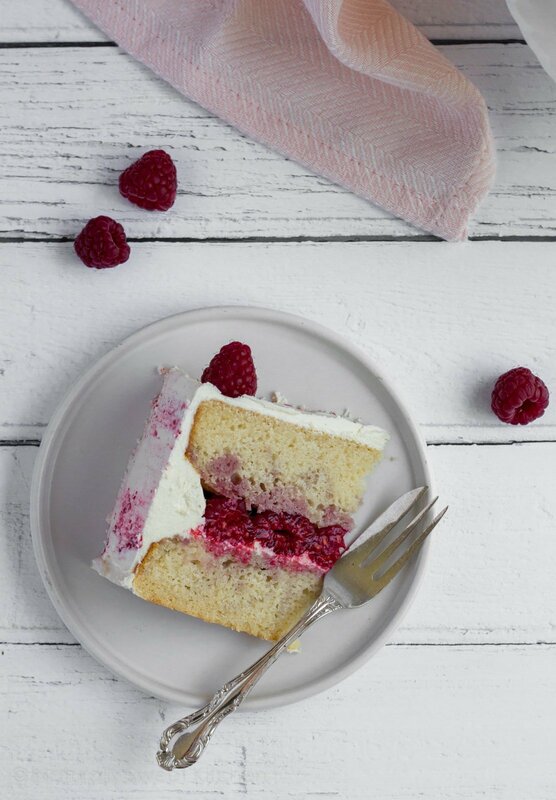 We have a lovely, delicate vanilla sponge, made only with egg whites to keep it as white as possible, with a ripple of fresh raspberry puree throughout to give it punchy flavour. The centre is lined with bright, fresh raspberries, and the entire thing is coated in a smooth white chocolate heritage frosting with a smear of raspberry puree for decoration. Do not be alarmed if you haven’t heard of it, heritage frosting is surprisingly easy to make. In my quest to find refined sugar free frosting alternatives to the usual butter/icing sugar duo, I’ve had to get a little creative. Although swiss meringue buttercream remains a firm favourite, sometimes I just can’t be bothered to make meringue. Therein lies the beauty of this heritage frosting. You cook up a pudding of flour, sugar (in this case raw sugar, but I think honey, maple syrup, and agave versions are in my near future! ), and milk over the stove, wait for it to cool, and then beat it with butter to create a smooth, matte buttercream which was perfect for frosting this White Chocolate Raspberry Ripple Cake. Another new ingredient we use is cocoa butter. Cocoa butter is used in the production of chocolate; it’s the pure ingredient that gives chocolate its distinct flavour. Because white cooking chocolate is often laden with refined sugar, I need a natural alternative that I could control, and cocoa butter works perfectly. 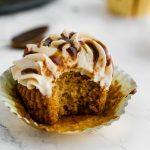 The frosting tastes exactly like a normal white chocolate buttercream – all of my taste testers were convinced I’d used conventional white chocolate! If you’re Canadian, I hope you have a wonderful holiday weekend full of fun celebrations and time spent with family and friends. Me? I’ll be taking Canada Day easy this year. I’ll be cutting myself a slice of cake, raising a glass of rosé, and toasting Canada’s 151st birthday. In the peace and quiet of my little London flat. 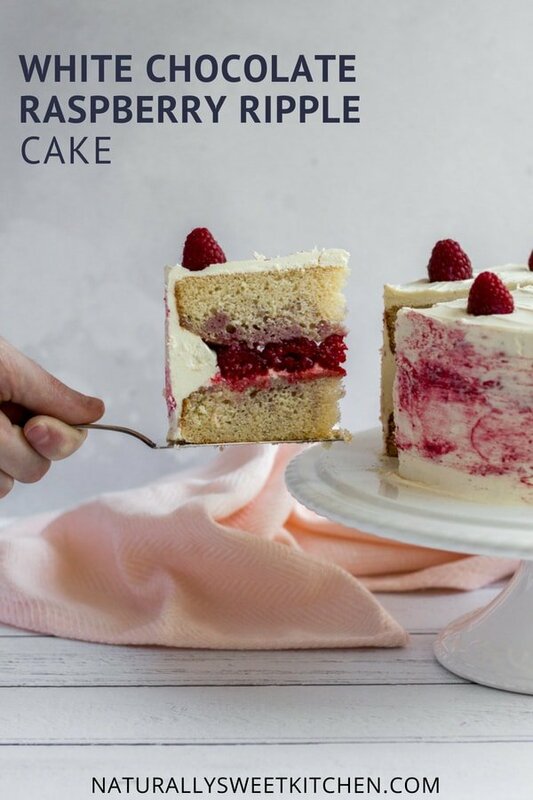 Modern and elegant, this White Chocolate Raspberry Ripple Cake will make your guests ooh and ahh when you place it on the table. 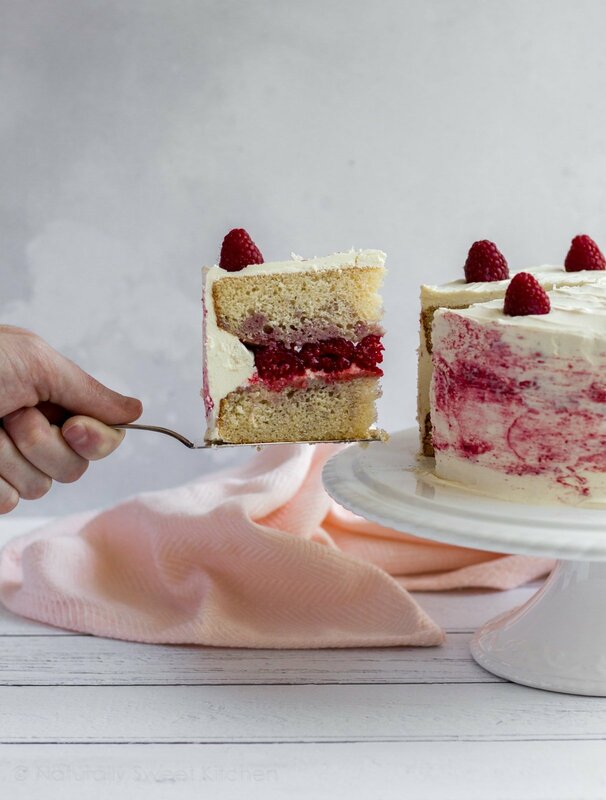 Encased inside the velvety white chocolate buttercream are two layers of light, white vanilla sponge swirled with homemade raspberry puree, sandwiching a layer of sharp, fresh raspberries. Combine the raspberries and honey in a small saucepan over medium low heat. Cook the raspberries, mashing and stirring occasionally, until the mixture is reduced by half and very thick – about 15 minutes. Strain out the seeds by pushing the puree through a mesh sieve and then leave it to cool to room temperature. Reserve 2 tablespoons of the puree for decoration. Whisk together the flour, sugar, salt, and milk in a small saucepan over low heat. Allow the mixture to come to a boil, whisking occasionally, and then boil for 1-2 minutes or until it is slightly thickened. It should have the consistency of a loose pudding. Pour the mixture into a container and refrigerate it while you complete the cake steps below. Preheat the oven to 175°C (350°F) and grease, line, and lightly flour two 8” cake tins. Sift the flour, baking powder, and sea salt into a large bowl, give it a quick whisk, and set aside. 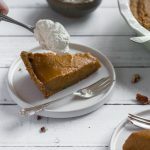 In the bowl of a stand mixer fitted with the paddle attachment, cream together the butter and sugar on a medium speed until fluffy and pale, then stir in the vanilla. Add the egg whites, two at a time, mixing for 30 seconds and scraping down the sides of the bowl in between each addition. 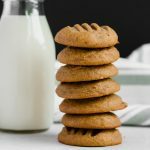 Turn the mixer to a low speed and alternate adding the dry ingredients and milk: add one third of the flour mix, then one half of the milk, then the second third of the flour mix, then the second half of milk, and finally, end on the third portion of flour. Give the batter a scrape and one final 10 second whizz up. Remove 250 grams of the batter into a separate bowl and fold in the large portion of raspberry puree. Take one half of the vanilla cake batter and divide it between the two cake tins. Take one quarter of the raspberry batter and make three dots of batter on top of the vanilla batter in the tin. Repeat this step with the second cake tin. Divide the remaining vanilla batter between the two cake tins, taking care spread it evenly over the raspberry batter, not all in one dump or the swirl won’t work. Divide the remaining raspberry batter between the two cake tins, dotting it in as in step 8. Using a butter knife, swirl the batter in the cake tins in a vertical “M” formation. Rotate the cake tins 90° and repeat the swirling motion. Repeat this step twice more. Tap the cake tins lightly on the counter to level the batter and then bake them for 24-27 minutes or until a toothpick comes out clean and the sponges spring back when touched. Allow the cakes to cool in the tins for 10 minutes, then remove them to a wire rack to finish cooling completely. While your cakes are cooling, finish the frosting by adding the butter to a clean stand mixer fitted with the paddle attachment. Beat the butter on high for 5 minutes, or until the butter is fluffy and pale. Decrease the speed to medium and drop in the cooled flour pudding 1 tablespoon at a time. Once all the pudding is added, increase the speed to high and beat until super fluffy. Lower the speed to medium and very slowly drizzle in the cocoa butter at the side of the bowl. Give it another good whizz and then cover and refrigerate until your sponges have completely cooled. This will allow the frosting to firm up a bit if it’s become loose from the cocoa butter. If necessary, level your cakes using a serrated knife or cake leveler so there are two even layers. Choose a bottom layer and place it on a decorating table or cake stand. Plop a half cup of frosting onto the cake and smooth it out to the sides. Create a slight indentation in the middle for the raspberries, leaving about half an inch along the outer rim. Place the raspberries in a single layer inside the frosting circle. Place the second layer of cake on top of the raspberries and press down gently to secure it. Use the remainder of the frosting to frost the top and outside of the cake. To create the raspberry smear, dot teaspoon sized amounts of the reserved raspberry puree all over the sides of the cake. Using a cake scraper, smear the raspberry dots into the cake by holding the scraper next to the cake, just brushing it, and gently turning the cake table or stand. Repeat this until you are happy with the level of smear. Top with fresh raspberries if desired. Both the white chocolate heritage frosting and raspberry puree can be made up to 3 days in advance. Bring to room temperature before using. This looks like a great way to celebrate Canada Day. Love the red and white. Raspberrry and white chocolate are to die for! Thank you! Hope you had a lovely Canada Day! I am so intrigued by the Heritage Frosting, Amanda. 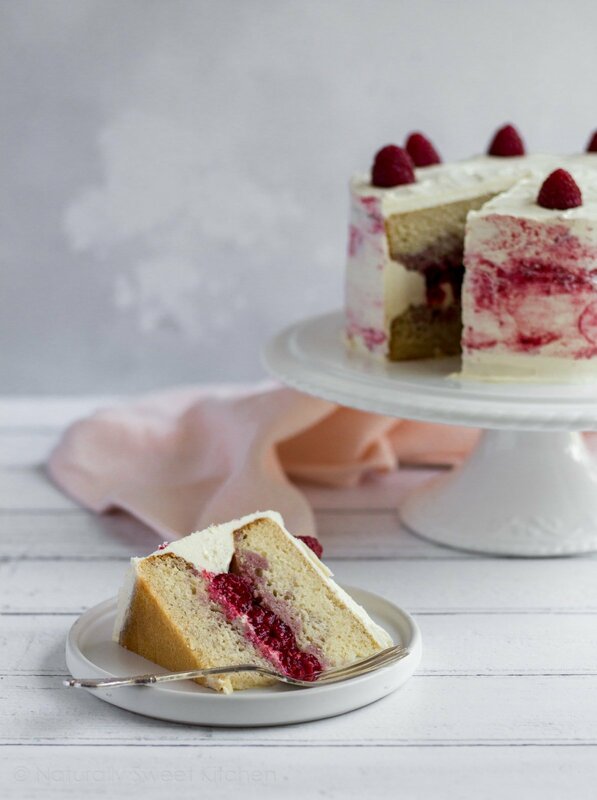 The White Chocolate Raspberry Ripple Cake looks delightful, tasty and rich. White Chocolate and Raspberries are a great pairing. I look forward to trying it. Hope you enjoyed your Canada Day abroad. Cheers! Hi Denise! Thank you for your lovely comment! 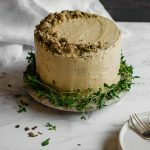 I definitely encourage you to give heritage frosting a try – it’s dead simple and tastes delicious!